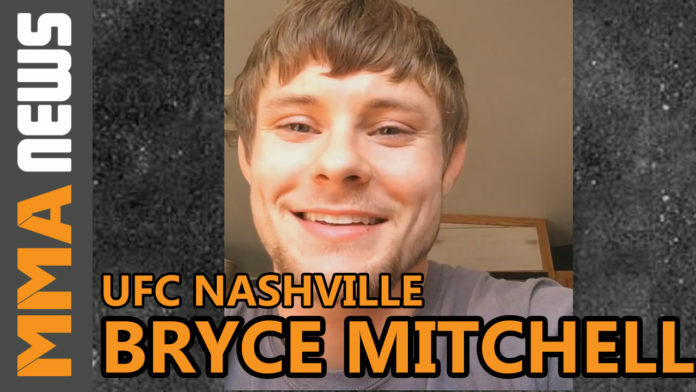 Most fans figured Bryce Mitchell’s next opponent was going to be Dan Ige. If you missed it, the pair of featherweights went back-and-forth on Twitter last month, even involving manager Ali Abdelaziz – who Ige works for at Dominance MMA. But instead, Mitchell is scheduled to face Bobby Moffett at UFC on ESPN+ 6 on Mar. 23. While he’ll be the first to admit that the opponent never matters, the news did catch the TUF 27 competitor off guard. Mitchell (10-0) returns to the cage after suffering a gruesome scrotum injury last year and will be competing for the first time since his promotional debut in July 2018. While he respects Moffett as an opponent, there is a bit of added revenge for “Thug Nasty” ahead of the matchup. With MMA Lab product Moffett on deck first, Mitchell says the jiu-jitsu match against Abdelaziz is on hold at the moment. However should he come out healthy after Mar. 23, Mitchell feels confident the matchup will happen.